Keeping reptiles can be very rewarding and many different types of reptiles – snakes, lizards, turtles, tortoises, etc. – make great pets. 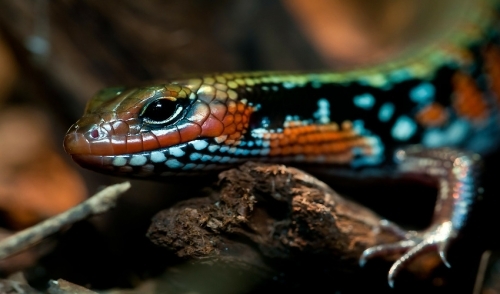 They are not like cats and dogs, however, and it is important to understand reptiles' health needs in order to provide them a comfortable, safe home. If you can recognize the most common reptile diseases, you can easily take steps to keep your pets happy and healthy. Because many symptoms are quite general and could be signs of different diseases, an expert veterinary diagnosis is essential to ensure your pet reptile gets the proper treatment. Turtles are especially prone to ear infections. A bulging ear drum, pus around the ears and pain when the mouth is opened are all key ear infection symptoms. Head shaking and general sensitivity around the ears are other clues. Treatment: Clean the reptile's environment, adjust temperature and humidity to proper levels and ensure the reptile's diet includes adequate vitamin A.
Amebiasis is a bacterial infection that is more likely to affect carnivorous reptiles, especially those that eat a diet of raw meat. Insect-eating reptiles are less likely to be infected with this disease, but it can still happen. Treatment: Be sure all feces are cleaned up to minimize contamination and isolate infected reptiles to prevent the disease from spreading to other pets. This viral infection is especially common among turtles and tortoises, which may show excessive itching or mouth sores in addition to other symptoms. Left untreated, this disease can cause severe liver damage as well as damage to the digestive tract. Treatment: Thoroughly disinfect the reptile's habitat and administer antiviral medication as prescribed. Ointments and oral medicates are both options. This disease, also called swollen vent, is an inflammation around the reptile's vent – the opening where feces and urine are expelled. It may be caused by stones or clogs, as well as other infections. Treatment: Remove any obstruction of the vent and clean the area well. Antibiotics may be prescribed for severe infections. A balanced diet can help prevent cloacitis. This disease can cause bowed legs or other deformities in reptiles, including soft shells in turtles. Reptiles that eat only plants or insects are more prone to developing metabolic bone disease because they ingest insufficient calcium. Treatment: Provide a diet rich in calcium and vitamin D, as well as full spectrum UV lights for reptiles to better metabolize calcium. More formally called stomatitis, this disease is caused by bad diet as well as poor temperature and humidity conditions in a reptile's habitat. Mouth sores or infected tissues will develop, and in severe cases, surgery may be required. Treatment: Keep the reptile's habitat at the proper temperature and humidity levels, and keep the tank or aquarium clean. Antibiotics may be prescribed. Because so many of the most common reptile diseases are spread through a poor environment, it is critical to keep your reptile's habitat in peak condition to keep your pet healthy. Check the environment's temperature and humidity levels regularly, and make any adjustments necessary to keep the readings within your pet's optimum range. Clean and disinfect the tank or cage often, removing all feces, leftover foods, soiled bedding and other debris. Provide a nutritious, balanced diet to your pet, paying attention to meeting all their vitamin and mineral needs. With this type of good care, you can help your reptile stay healthy and avoid many of the most common diseases pet reptiles can succumb to.